NY-20: Does a Tie Mean the Nation is Brutally Divided? If a Tedisco win meant the beginning of a Republican comeback nationally and a Murphy win meant the nation is on-board with the Obama administration, what does a 65 vote margin with 610 of 610 precincts reporting (and a few thousand absentee ballots to be counted) mean? There's only one answer to that: elections are fun! UPDATE: As per Jack, via The Saratoagian, it's now down to a 25 vote Murphy edge in NY-20. FHQ has been quiet on this one, which is unusual for an elections site. But special elections are nice. For elections nerds like myself, they are a welcome respite from the dark period between regularly scheduled elections. However, it is difficult to apply lessons learned from past special elections to any new one that comes along simply because the circumstances from one special election to the next (or from a general election to a special election) vary so widely. The congressional special elections in the winter and spring of 2008 were nice in that all of them were conservative districts that broke toward the Democrats. There was something of a trend that could be parsed from that; a trend that culminated with Obama winning the White House and Democrats increasing their majorities in Congress. But it's easy to read too much into these specials. For one thing, they aren't always successfully nationalized. Often they hinge on state or local quirks. Scott Murphy is attempting to nationalize the NY-20 special by linking Jim Tedisco to the likes of Rush Limbaugh, Sarah Palin and George W. Bush. And Tedisco, for his part, is running away from national Republicans despite leaning on NRCC money. In the context of decreasing poll numbers, that's never really a good sign. Can we extrapolate anything from those poll numbers, though? Given that there have only been six polls* conducted (three of them partisan), there isn't a whole lot of information out there. What those polls do tell us is that the trend has been toward Murphy. He has gained 8 points from poll to poll in the Siena sequence of polls and has a lead that is right around the margin of error to slightly above it. But drawing anything anymore substantive than that from those numbers is a fool's errand. [Just look back to the Georgia Senate runoff for one such example.] Specials always come down to turnout. And with this race being so closely scrutinized on the national level, polling could either energize Republicans (in a Republican-leaning district) to head out to their nearest polling station or it could, given the current trend and the potential perception of reality, keep them away. For Democrats, it is a question of whether they are still as motivated as they were in November when Obama won the district by three points and incumbent Democratic congresswoman (turned senator), Kirsten Gillibrand, took over three-fifths of the vote. But, does the tide wash a little further up the beach or has it already begun receding? That's what the media will be talking about tonight when the polls close at 9pm, but in special elections it is rarely that black and white. The results will do a better job of telling us whether Murphy was able to successfully nationalize this race. *You'll have to back out to Pollster's front page to see the information on the sixth poll; the third one conducted by the DCCC. But as Jay Cost said yesterday over at the HorseRaceBlog, it really isn't as simple as Obama opting out broke the system. The seeds for this were sewn all the way back in 1980 when John Connally shunned the public financing system to go-it-alone in his bid for the Republican nomination. Of course, his $11 million raised (just more than $28 million in 2009 dollars) earned one whole delegate, but the idea was out there. Candidates for office, especially the presidency, could out-raised the matching funds cap, not have to adhere to state spending caps (during the primaries) and be much better off because of it. Now, Connally's tremendous failure was an example that certainly caused many a presidential campaign pause, but by 1996 the system had (really) outgrown its usefulness. A self-financed candidate like Steve Forbes could enter the fray and make waves without any real political experience. That his efforts and the competition from others in the Republican field that year put Dole at a major disadvantage once the Kansas senator wrapped up the nomination was a lesson to future candidates on both sides of the aisle. In other words, if your gauge is pointing to E at the end of the primary phase and your opponent's (especially an incumbent) is not, then your bid for the White House is going to be that much tougher. And that lesson was extended to the general election campaign last fall. No candidate can put him or herself behind such a financial eight ball and hope to wind up in the Oval Office. H/t: John Pitney over at Epic Journey for the Cost link. Good stuff. File this one under things I should have checked for when I was updating the 2012 Presidential Primary Calendar last week. What I missed was the fact that there is a companion bill to HB 759 in the Florida State Senate. Now, here's the thing about HB 759 and the Senate version, S 2304: They are sponsored and being pushed by Democrats in a Republican-dominated legislature. Rep. Kevin Rader filed the House version in early February, but the Senate version was not filed by Sen. Arthenia Joyner (the minority whip) until the end of February. While both bills call for a return to the second Tuesday in March date the Sunshine state used for presidential primaries between 1976 and 2004, that outcome isn't likely during this session unless and until the Republican Temporary Delegate Selection Committee makes a recommendation to the full RNC that would potentially put Florida's current (last Tuesday in January) position in violation of those rules. In other words, there is no urgency to the matter at the moment (...from either party's perspective). The Democrats just want to get something done while the issue is still somewhat salient. And the Republicans are just taking a wait and see approach. Round three voting is now underway in NPR's Political March Madness (link above). And if round two is indicative (a significant increase over the first round's paltry number of upsets), the third round should be pretty unpredictable. I think it is safe to say that this thing has been hijacked in a way that Diebold could even appreciate. But a Ron Paul-Barack Obama general election should be a fun one. Looks like Obama's pick (a wise one it was) to win it all in college basketball has advanced to the Final Four. I have to make some effort to put a political spin on things, but I am an alum. Well, this is the only team he actually played a pick-up game with on the campaign trail last spring. Look folks, we're in the midst of the 2012 invisible primary right now. Whether you like it or not, prospective candidates are attempting to position themselves for a run at the White House in three years time. Part of what gets the ball rolling on future fundraising, consultant networking and valued endorsements is having your name mentioned in those discussions. If your name is being dropped in the context of a White House run it makes it much more believable than if it were not. MR. GREGORY: In terms of future leaders of the Republican Party, would you like to see Sarah Palin become president? SEN. McCAIN: I’d like to see her compete. I think we’ve got some very good candidates: Jon Huntsman and–the problem when I run down these names, I always leave, leave out a, a name–Bobby Jindal, Tim Pawlenty. There’s, there’s so many. There’s a lot of good, fresh talent out there. Jindal and Pawlenty are not newcomers to this discussion, nor is Sarah Palin, for that matter. All were talked about as potential running mates for McCain last fall, and VP talk to future White House run is a logical extension. And though Huntsman wasn't in the VP chatter, his name has been bandied about as a darkhorse for 2012. FHQ has been quite high on the current Utah governor in our 2012 brackets discussions (see here and here), and as GOP 12 notes, McCain hasn't been shy about mentioning the governor (an early supporter of the Arizona senator's presidential bid ahead of 2008). My question (and it is one I see the folks over at GOP 12 asked as well): You know who isn't being mentioned? But neither is Mike Huckabee. And that sets up an interesting dichotomy to the emerging GOP field for 2012. There's an old guard/new face split there. And that came into play with the seeding in FHQ's bracket yesterday. Among those top four Romney, Huckabee and Gingrich all represent the conventional wisdom on GOP presidential nominations: The next guy in line gets it. The bottom half (Pawlenty, Huntsman, Sanford and Crist) are the fresh faces. [Bobby Jindal fits here too.] Sarah Palin has elements of both groups. For his part, McCain seems to be a fresh face kinda guy. But having the former nominee of the party mentioning your name in the context of a presidential run can't hurt. Last week when I posted the retrospective 2008 presidential candidate bracket, I said that I wanted to put one together for 2012 as well. 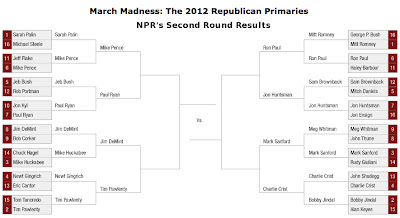 Well, I did before NPR put out their bracket with the top 32 GOP contenders for 2012. Still, some were interested in seeing FHQ's top 8. Here, without comment, is that Elite Eight (with an Obama Tanks and is Challenged scenario tacked on). The comments section awaits your cheers and boos. You'll also see that the live link has been removed from Illinois. This reflects the fact that the legislation before the legislature there applies only to the date of the primary for state and local offices. For the sake of tracking relevant legislation dealing with presidential primaries generally, but not dates directly, FHQ will include links in parentheses next to such states. Illinois: The House bill proposes moving the state's primaries for state and local offices back to the traditional third Tuesday in March date while leaving the presidential primary on the first Tuesday in February. Senate action has a similar intent, but the non-presidential primaries would move to June. Indiana: The Senate Concurrent Resolution would form a committee to examine the wisdom of a potential frontloading move. Minnesota: Companion bills in the House and Senate would change the state's mode of delegate selection from a caucus to a primary on the presidential level. Oklahoma: A House bill would shift the financial burden of the presidential primary from the state to the parties with nominations at stake. Remember that a less messy version of the calendar is always present in the left hand side bar. Minnesota, like Oklahoma, isn't examining a repositioning of its delegate selection event for 2012, but the state legislature (both chambers separately) is considering altering the mode of delegate selection. [No, that isn't in keeping with the week's focus on date-shifters, but it is relevant to the 2012 primary calendar discussion.] Traditionally the North Star state has used the caucus system as its means of allocating national convention delegates. In fact, the only time during the post-reform era (1972-present) that Minnesota used a primary as its means of delegate allocation was in 1992. And then it was only the GOP that opted for the primary (in a year with an incumbent Republican running virtually unopposed). It is fairly significant, then, that the most populous remaining caucus state is considering adopting a primary system for presidential nomination delegate allocation. [Technically, Washington is the most populous caucus state, but the Evergreen state uses a hybrid system (primary/caucus) on the Republican side and a caucus with beauty contest primary on the Democratic side.] There are companion bills in both the state House and Senate that would keep the state's delegate selection event on the first Tuesday in February but change the selection mode from a caucus to a primary. This is a mostly Democrat-driven initiative (with only one Republican representative among the group of sponsors) that would address many of the problems heavy turnout in last year's presidential caucuses caused. Mainly, with state funding the process would likely have an increased number of polling places that would prove more accommodating than the jam-packed (especially Democratic) caucuses were during 2008. Now, both HF 31 and SF 157 were introduced in January and have been in committee ever since. That could either mean that both are the victims of the legislative process and/or that they have fallen victim to the current economic climate. Primaries mean increased state expenditures and those are much harder to justify given current economic circumstances. Another layer to add into the state legislature's calculus is considering whether 2008 was an anomaly in terms of turnout. If the overarching expectation among experts and, then, legislators is that future turnout will revert to previous levels then the desire to move from a caucus to a primary likely drops (and even more so given the interaction between that idea and the cost effectiveness of such a move.). Like the other bills we have examined in other states this week, though, this legislation is worth tracking in the (now long) lead up to 2012. There are two points about Illinois I want to deal with in this space. First of all, some of the points in our earlier discussion of the state legislative action in Land of Lincoln were incorrect. A closer reading of SB 46, the bill at the heart of that earlier post, reveals that the presidential primary is not a part of the equation. As has been discussed here more times than regular readers probably care to remember, states are constrained in their ability to frontload based on whether the state holds its presidential primary concurrently with its primaries for state and local office. States that have already severed those ties find it much easier to move that those states where a decision has to be made between moving everything or splitting those primaries and funding an all new presidential primary election. Illinois is one of the states that has traditionally held its primaries concurrently in the post-reform era. When the state legislature opted to move the state's primary from March into February in anticipation of the 2008 election, all the primaries moved. Now, however, the state legislature is considering a couple of proposals (one more than was initially known to FHQ) to split those primaries, leaving the presidential contest in February, but moving the primaries for state and local offices back. The state senate legislation mentioned already proposes moving those contests all the way back to June. This move has been spearheaded by a long list of Republicans senators. On the House side, though, the proposal (HB 2308) is led by a handful of Democrats and the move is far less drastic; moving those state and local primaries back to the state's traditional third Tuesday in March primary date. Yeah, but those aren't presidential primaries, are they? No, they aren't. However, should this legislation make it through the legislature and be signed into law it will make future attempts by Illinois to frontload that much easier. In my initial examination of this "split primaries" issue, those split primaries states from 1976-1996 were over five times as likely to frontload as those states where all primaries were held concurrently. That effect has lessened over the last few cycles however. Including data through 2008, split primaries states are still well over twice as likely to move as their concurrent primaries counterparts. Of course, both of the pieces of legislation cited above are also currently stuck in committee. While neither is in jeopardy at the moment, it isn't clear how likely either is to pass the through the whole legislature. Pat Quinn, Rod Blagojevich's replacement, signaled early on once he assumed office that he was interested in moving state and local primaries back to a later date. So there is some support for the idea there. You didn't expect New Hampshire to stand idly by while other states move in anticipation of 2012, did you? Well, they're not, but what the General Court typically does in the Granite State is simply tweak the election law's language to protect the state's first-in-the-nation status. New Hampshire, after all, is unique because the legislature long ago ceded presidential primary scheduling power to the secretary of state. The advantage there is that one person can more easily make the decision on when the primary should be held. That avoids the potential for partisan wrangling (though it should be admitted that all or most of the legislators in the state support New Hampshire's status being retained) that could potentially delay the decision. HB 341 was introduced and referred to committee on January 8 and has been there ever since. It may make its way out (Splaine is a member of the Election Law Committee. ), but I'd guess that the folks in New Hampshire will take a wait-and-see-approach to this; waiting on what both the national parties decide to do about their nomination rules in 2012. Now, none of this may prove necessary, technically. With the Democratic Change Commission (DCC)having been announced and the GOP still settling on the remaining members of its own Temporary Delegate Selection Committee (TDSC), there has been some discussion of Iowa and New Hampshire in 2012 already. And sources from both sides seem to be indicating that the Granite state is safe for 2012. On the Democratic side, new DCC member from New Hampshire, Ned Helms, who was a state chair for the Obama general election campaign, insists that Iowa and New Hampshire are safe. The Iowa/New Hampshire issue may come up when the 37 members of the DCC get together, but the commission's intent is not to change Iowa and New Hampshire's positions. Embedded in that link is a nice mention of the window for future contests being closed to exclude the potential for any January contests. But that move is dangerous given how many states have "first Tuesday in February" primary dates. Even on its latest possible date, the first Tuesday in February would fall on February 7 (as it does in 2012). That would mean that either Iowa and New Hampshire squeeze into the other six days, decreasing their impact, or that state legislatures -- some of them not necessarily friendly to the wants and needs of the Democratic Party -- will have to make changes to bring their states into compliance. And what happens if February 1 is the first Tuesday in February? Again, good idea from an intentions standpoint, but with MANY unintended consequences. Just yesterday a bill to move Arkansas' primaries for all offices to June (from late May) emerged from committee. That bill, though, doesn't appear to have widespread support because despite the "Do Pass" authorization SB 253 got from the State Agencies and Governmental Affairs Committee, that bill was withdrawn today by its sponsor, Steve Faris (D-Malevern). Now, it should be noted that Faris was not only the sponsor of the legislation but is the chair of the committee that granted the "Do Pass" distinction for SB 253. Being in that position certainly helps push a bill through committee, but county clerks also had issues with the effect a June primary may have on turnout. I suspect also that legislators in the full body were somewhat wary of making another change less than two months after repealing the separate February presidential primary. It does, however, look like the state will take the Indiana approach and form an interim study to better estimate the ramifications of a June primary. Earlier this year, in a similar series of posts, FHQ looked into the possibility of New Jersey shifting its 2012 presidential primary (currently set to take place on February 7, 2012) because of a provision in a recently passed bill allowing the lieutenant governor the power to move elections if they conflict with religious holidays. Now, that discussion centered on Republicans taking over the executive branch after the elections this fall in the Garden state and then, somewhat frivolously, using the power in the above law to move New Jersey into an advantageous position on the 2012 calendar. If Republicans were able to take over the executive branch [That just means winning the governor's race since the governor would, then, appoint a lieutenant governor], they could be motivated to put the Garden state in a position to have a real influence on the GOP nomination race. But, again, that scenario is something of a stretch. It certainly depends on several things falling into place first. Granted, Jon Corzine is doing his best to help the GOP cause in the gubernatorial race, but we'll have to see how things go on that front. No, there is actually legislation -- carried over from the 2008 legislative session -- that addresses the date of the state's presidential primary. New Jersey, though, isn't following North Carolina or Oregon's lead. [The state government would challenge the national party rules to frontload further as the state is already on the earliest allowable date. Moving foward further, then, would mean violating those rules, at least as they existed for the 2008 cycle. Those rules could change.] The bill (A 2413) seeks to, as was the case in Arkansas, eliminate the separate presidential primary and move it back in line with the primaries in the state for statewide and local offices. In other words, the presidential primary would move back to the end of the presidential primary queue and be held on the Tuesday after the first Monday in June (June 5, 2012). Interestingly, this legislation is being pushed by a Republican state representative. And I would assume that the move is not one proposed as a means of depriving New Jersey an impact on the GOP nomination, but more so as a way of saving money for the state. And this was the case in Arkansas as well. 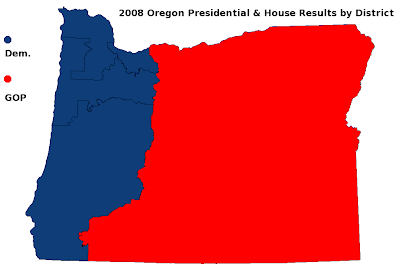 The issue here is that states which have recently (read: in 2008) separated their presidential primaries and primaries for state and local offices are faced with more of a quandary than states that have split primaries, but have institutionalized the separate presidential primary over a series of presidential election cycles. For example, many of the states in the northeast have August or September primaries for state and local offices which basically forces a separate presidential primary (so that it complies with the national party rules concerning the scheduling of presidential delegate selection events). With a June primary in place, New Jersey is not in that position. The other obvious question here concerns the likelihood of this bill passing. Again, this bill is sponsored by a Republican in a chamber (and overall legislative body) controlled by Democrats. That doesn't mean the bill can't gain Democratic support, but the fact that it has been stuck in committee since basically this time last year (It was referred to the State Government Committee on March 3, 2008. ), doesn't bode well for its chances of passage. Still, the bill is worth tracking and is probably a much more plausible avenue for a primary date change than the alternative mentioned previously. "...the May primary for state legislative positions will occur within a couple of weeks of the end of the one of the legislative sessions. That leaves only a small window of time for incumbents to campaign for the election. On top of that, legislators have traditionally eschewed fundraising (due to a self-imposed rule) activities during sessions and for 30 days before and after them. That obviously encompasses the primaries in this case and poses a problem for state legislative incumbents." The amendment process had the bill in and out of the Senate committee on State Agencies and Governmental Affairs and first changed the language to meet the changes (repealing the presidential primary and moving back in line with other primaries) signed into law before moving the proposed primary date back to the first week in June. This latter change was no doubt instituted because of the national party rules that cut the nomination phase of the presidential election off during the first couple of weeks of June. That also gets state legislators closer to their goal of having 30 days in between the end of the legislative session and a primary election. There may be a couple of days lost, but that gets incumbents closer to their self-imposed rule and within the national party guidelines for delegate selection. And those amendment changes seem likely to be pushed through. The bill just yesterday emerged from the State Agencies and Governmental Affairs Committee with a "Do Pass" authorization (see bill link above for a detailed look at the list of actions SB 253 has been through). Committees in both chambers granted HB 1021 (the original bill to repeal the presidential primary and move it back to May) the same authorization before it was passed and signed into law. So buckle up folks. 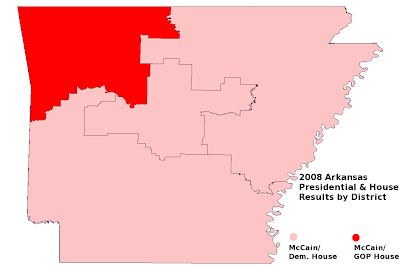 Arkansas may not be done backloading for 2012 and beyond yet. Back in January I discussed several states where legislative action was already underway to shift presidential primary dates for the 2012 cycle. Recently though, I happened upon a great new resource -- thanks to the good folks at Election Updates -- for tracking various election reform legislation in state legislatures. As it turns out, there are several states missing from consideration. Now, Oklahoma's bill doesn't deal with the date of the primary, only where the funding is coming from and the New Jersey discussion was based not on a direct date change but on a law that allows the lieutenant governor the ability to change a primary date if it conflicts with a religious holiday. However, Arkansas, Florida, Illinois and North Carolina have actually proposed date-shifting bills and had varying levels of success in passing them (Arkansas' passed and Illinois' is still in committee.). In both cases however, the moves (or potential moves) buck the recent trends and shift their states' presidential primaries to later dates in 2012. But not everyone is backloading. This week, then, we'll have a few more installments in this series detailing state legislative action on this front. There is actually additional legislation in both the Illinois and New Jersey legislatures that would shift their presidential primaries in 2012 and beyond to later dates. Also, there is a bill before the New Hampshire General Court -- the Granite state's legislature -- that tweaks the language of the state's presidential primary law to further protect the its first-in-the-nation status. Finally, there is also a bill being considered in the Oregon legislature to move the Beaver state's presidential primary (and all other primaries for state and local offices) to the first week in February. Oregon has done this before. In 1996, the Beaver state shifted its presidential primary into March (from May) and ended up aligned with the remnants of the 1988 Southern Super Tuesday and more importantly two weeks ahead California (which had also already moved that cycle). That did not prove a good mood since most of the GOP candidates' attention was focused on the nearly contiguous group of southern states. In 2000, then, Oregon opted to save money (I'll have to track down the data I have on this from the Oregon Secretary of State's office. Off the top of my head the state saved $3 million by backloading in 2000.). What's curious is that the state's voters approved the statewide mail-in ballot system in 1998, so it could have been done more cheaply in 2000 as a result. In 2007 the bill was introduced in the House at the request of Democratic Secretary of State Bill Bradbury. In 2009, though, the action has originated in the State Senate from the Republican minority. This isn't a surprise since typically changes of this type take place within the party outside of the White House. Again, the bill (SB 412) would shift the Oregon primaries for all offices to the first Tuesday in February in any presidential election year. And thus far Oregon is the only state other than North Carolina to propose moving ahead (Indiana doesn't count here, yet.). On top of that, the Beaver state is moving all the other primary elections forward. Well, the proposed approach is like Illinois' in 2008. The bill was introduced during the first week in February and was immediately referred to the Senate Rules Committee where it has been couped up since that time. Again, the proposal is a Republican one in a Democratic-controlled legislature (and a Democratic governor to boot). The likelihood of this getting out of committee, then, is lower because of the partisan implications involved. The legislature will adjourn until 2011 (barring a special session next year) no later than June 30. So there is a time constraint here as well. 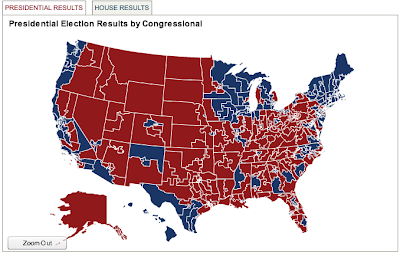 No, they don't have a layer that shows the split presidential and House districts, but this interactive map that CQ put together to accompany the data they've put out over the last couple of weeks is pretty snazzy. And the clarity of the district lines is great. Click on the link under the map to go play around with it. 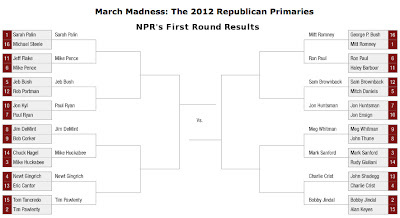 Sure, the bracket pairings don't match up the way they're supposed to, but the second round is set in NPR's Political March Madness. Click on the link above (directly under the bracket) to vote in round two. Those results will be posted on Monday (March 30). Spoiler Alert: There was only one upset. (12) Brownback over (5) Daniels. I was looking at the vote totals yesterday and briefly considered doing a quick and dirty investigation of the correlation between the number of votes cast in a particular match up and the seeding/name recognition. The "no name" pairings, on the surface, had far fewer votes cast than pairings like Palin-Steele. And I think Brownback over Daniels fits that category to some extent. And here I thought the GOP would be the first to move on the issues attendant to the presidential primary system. "Today, Governor Tim Kaine, Chairman of the Democratic National Committee, announced the 37 member Democratic Change Commission, which will recommend changes to the Democratic Party's rules for the 2012 presidential nominating and delegate selection process. Governor Kaine also announced that he has named Congressman James Clyburn of South Carolina and Senator Claire McCaskill of Missouri as Co-Chairs of the Change Commission." Now, this is significant news, but first let's look a bit more closely at the intent of the Commission and then I'll give my rapid fire thoughts on the commission's membership. "The Democratic Change Commission will address three issues: 1) changing the window of time during which primaries and caucuses may be held 2) reducing the number of superdelegates and 3) improving the caucus system." First, changing the window means that the February experiment is over in the minds of some within the party. That's code for, "Let's move the starting point back to March." And there's a lot of talk out there about March being a good starting point. Most of that finds its root in any of the reform regimes that represent the most upheaval to the system (NASS rotating regional primary, Ohio Plan, American Plan, etc.). That, however, would set up quite a few potential showdowns with compliant-turned-rogue states (States that are compliant in February under the current rules, but would be in violation is the window were closed and did not include February.). For example, without some coordination with the Republican Party, the Democratic Party faces the possibility of having quite a few states (those in Republican control) not comply with any such effort to scale back the starting point of the window. Take my current home state of Georgia. Here's a state that finds both the governor's mansion and the General Assembly in GOP control. Now, are they really going to be inclined to move just because the Democratic Party says so (assuming the GOP holds pat on their own rules)? I doubt it. And Georgia isn't an isolated case here. Of the states holding primaries before March in 2008, Florida, South Carolina (which will likely be exempt anyway) and Tennessee all are in the same position. And Arizona's governor (now Republican after Janet Napolitano vacated to be Homeland Security Secretary) has proclamation power to move the state's contest earlier if the final week in February is not early enough for the Grand Canyon state to be consequential in the process. Add to that the very likely possibility that Oklahoma's next governor will be Republican and you have quite a few potential partisan rogues. This first point, then, seems like it could be messy. The second and third points will be talked about, but are more remnants of the unique 2008 primary season than anything. As was the case initially with primary reform in Republican Party during last summer's convention in St. Paul, the winning candidates rarely sanction the change of a system that brought about their nomination. The GOP for the first time created a loophole (allowing for rules to be set outside of the confines of the convention), but Barack Obama is the head of the Democratic Party and these latter two goals of the commission are among the chief reasons he received the Democratic nomination. Now, that isn't to say that some measure of reform in the areas of superdelegates and caucuses won't come to pass, just that it is less likely. Regardless, it is probable that there will be some scaling back of the number of superdelegates and there may be some incentivizing structure discussed to get some caucus states to shift to being primary states. On the latter point, though, the economy will have a large say in whether that happens. Primaries are the much more expensive route. There is a balance, then, that has to be discovered between the inclusiveness of a primary system versus the price tag of (not to mention the control state parties have over) the caucus system. Regardless, the ball is rolling now from the parties' perspective and not just at the state government level. WASHINGTON, March 23 -- Today, Governor Tim Kaine, Chairman of the Democratic National Committee, announced the 37 member Democratic Change Commission, which will recommend changes to the Democratic Party's rules for the 2012 presidential nominating and delegate selection process. Governor Kaine also announced that he has named Congressman James Clyburn of South Carolina and Senator Claire McCaskill of Missouri as Co-Chairs of the Change Commission. "This Commission will focus on reform that improves the presidential nominating process to put voters first and ensure that as many people as possible can participate," said Kaine. "I want to thank all the members of the Commission who have agreed to serve, including Congressman Clyburn and Senator McCaskill who have graciously agreed to serve as co-chairs." Governor Kaine went on to say that he hopes to work with the Republican National Committee on a common approach that puts voters first. President Obama first announced his intention to form the Democratic Change Commission in August 2008, during his presidential campaign. Delegates to the Democratic National Convention adopted President Obama's proposal on Monday, August 25, 2008. The Democratic Change Commission will address three issues: 1) changing the window of time during which primaries and caucuses may be held 2) reducing the number of superdelegates and 3) improving the caucus system. A copy of the convention resolution establishing the Commission is below. The Commission must issue its report and recommendations to the DNC Rules and Bylaws Committee no later than January 1, 2010. The Commission is made up of 35 members and two co-chairs and represents a diverse mix of DNC members, elected officials, representatives of State Parties, academics, labor, business, grassroots activists and other Party leaders. A complete list of the Commission's members is below. RESOLVED FURTHER: That the Delegate Selection Rules for the 2012 Convention shall provide that no meetings, caucuses, conventions or primaries which constitute the first determining stage in the presidential nomination process (the date of the primary in primary states and the date of the first tier caucus in caucus states) shall be held prior to the first Tuesday in March of the election year, except as otherwise provided in the Delegate Selection Rules and recognizing the valuable role played by the approved pre-Window states in 2008; and provided that no such meeting, caucus, convention or primary shall in any event be held prior to February 1 of the calendar year of the National Convention; and that the Commission also shall review the sequence and scheduling of primaries and caucuses with a view towards reducing the scheduling of such events on the first allowable date that resulted in 22 primaries and caucuses being held on such date in 2008 and toward reducing frontloading within the Window period; and that the Commission shall review the rules for proper enforcement of the primary and caucus timing requirements and delegate allocation matters, particularly with respect to action by the Rules and Bylaws Committee; and that in making its recommendations, the Commission consider any revision of the Rules of the Republican Party of the United States adopted by the 2008 Republican National Convention regarding the scheduling and sequence of presidential nominating events. a. the use of a caucus/convention system for any stage of the delegate selection process by any State Democratic Party shall be approved by the DNC Rules and Bylaws Committee in accordance with any new specific criteria to be set out in the Delegate Selection Rules, and which will be designed to ensure that at each stage, any caucus or convention will be adequately planned, organized, and staffed; will take place at such times and in such locations as will meet the requirements of Rule 3 of the Delegate Selection Rules and will otherwise maximize the opportunity for full participation by Democratic voters; will be run using appropriate balloting methods and, as to tiers following the first stage caucus, will utilize accurate lists of participants; and will afford the opportunity for meaningful communication of presidential candidates with their pledged caucus participants reasonably in advance of caucuses and conventions. I'm not sure that NPR is going to fix the flaws in their 2012 GOP nomination bracket, so I took the liberty of correcting it. First off, as I said in the comments over at the other post, the seedings weren't matched up properly. The way these things are set up, the top seed is supposed to play the lowest possible seed in the next round assuming there are no upsets. Why should the number one seed have to play the 6-11 winner when the three seed gets the 8-9 winner. If there were no upsets, the top seed plays the six and the three seed plays the eight. Look, politics isn't fair, but if were going to go this route, let's at least do it the right way. The other issue is a minor point, but one I thought should be addressed. These brackets need names. I'm going with the Reagan and Lincoln brackets. So, without further ado, my picks in what should be the real NPR 2012 bracket. Palin outduels Steele. DeMint advances against Corker in an SEC showdown. Rob Portman upsets Jeb Bush based on Bush fatigue. Newt takes out Cantor, and Mike Pence narrowly avoids being upset by Jeff Flake because Flake resembles Will Forte who used to do a mean John Edwards on Saturday Night Live. Huckabee dispenses Chuck Hagel and Jon Kyl inches past favored Paul Ryan. Finally, Pawlenty stays silent and lets Tom Tancredo eliminate himself. Hey, save it for the second round. In round two, Palin edges DeMint in an underrated showdown, Portman's fairy tale journey ends at the sweet sixteen against Gingrich, Huckabee outlasts Pence, and Pawlenty's first round rest pays off against Kyl. Round three see Gingrich upturn the former vice presidential candidate, and Pawlenty send Huckabee back to the book signing circuit. And in the Reagan bracket final, Gingrich emerges victorious against the Minnesota governor. Romney romps over a "before his time" George P. Bush. Hey, he'll turn 36 during primary season (...or after its over, if the calendar remains the same). John Thune takes out Meg Whitman and Mitch Daniels vanquishes Kansas Governor Sam Brownback. Charlie Crist puts down yet another Arizonan, John Shadegg. [Is it me, or are there disproportionately too many Arizona Republicans filling out this group of 32?] Haley Barbour uses his insider connections to beat back a strong fight from Ron Paul and meets Mark Sanford who eliminated Rudy. Utah Governor Jon Huntsman bests Jon Ensign in a Battle of the Jons and Bobby Jindal is able to put down a challenge from Alan Keyes. In the second round, Romney outdoes Thune, Mitch Daniels upsets Charlie Crist, Mark Sanford wins the southern governors showdown and Huntsman surprises Bobby Jindal. Round three sees Romney crush Daniels and Huntsman keep the upsets going with a defeat of Sanford. In the Lincoln bracket final Huntsman does the unthinkable and advances to face Gingrich in the finals. Not bad. A three seed against a seven. Just like my typical basketball brackets, I go for some upsets that aren't likely to happen. I like underdogs. What can I say? [You can say there's no chance this is going to happen.] I've Gingrich winning this one and moving on to face Barack Obama in what would be an interesting general election campaign.